Your message won't be missed on these attractive coasters. These custom printed absorbent stone coasters feature cork backs, come bulk packaged, and are USA made. Full color stoneware coasters make great business gifts. Bulk shipped in plastic wrapped rolls of 12 with tissue circles between coasters. Gift Box Packaging available at an additional charge, please call our Customer Service Department for details. Stock background designs are also available, please call for details. It was attractive and we thought it would complement our logo. My fiancé and I want do coasters as our wedding favor and we want them to be a watercolor picture of Mt. Hood with trees surrounding it and our name and wedding date in the bottom right hand corner. Is there any way you would be able to do that? 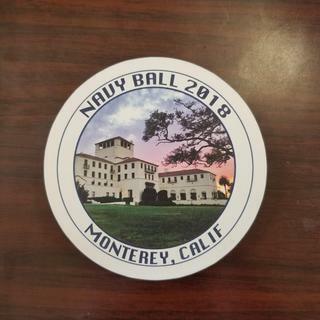 Hello, would your art team be able to provide me with a couple sample coasters? Hi, I do custom art work and am interested in having some of my work reproduced as coasters to sell at historical sites, tourist attractions and event venues. What is your turn around time? How are the coasters packaged?What could I expect to pay in shipping cost (to Macon, GA)? Thanks so much for your help! BEST ANSWER: Hi Dale. Thank you for your interest. Depending on the quantity, the production time on these is 10-15 business days from proof approval. These are bulk shipped in plastic wrapped rolls of 12 with tissue circles between coasters, but gift boxes are available also. For 100 coasters, ground shipping is estimated at $22.17. ITEM# COA0234 - can I get that with individual boxes for mailing each coaster? BEST ANSWER: This item doesn't have an individual mailer box option, however there is a window box to gift/display. Process worked smoothly and quickly. My agent was kind and walked me through each step, reconfirming what was ordered and when it would arrive. Could not be happier. People fought over these and even stole them off other tables. Complete hit! Hi Sonja, thank you for your positive and kind review! We are so happy these were successful and we hope you had a lot of fun at the ball. We love the picture! We look forward to working with you again on your next project!